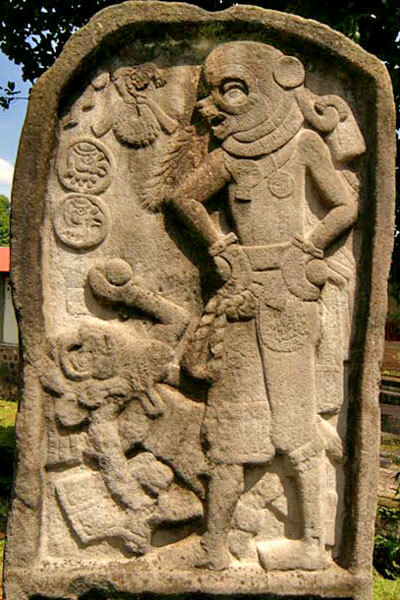 Santa Lucia Cotzumalguapa is an important archaeological zone of Guatemala, located in the department of Escuintla, at the foot of the Pacific volcanic range. Judging from current evidence, this area experienced an early development going back at least to the end of the Early Pre-Classic period (800 BC). By the Late Pre-Classic period, the region was the settlement for an important kingdom. 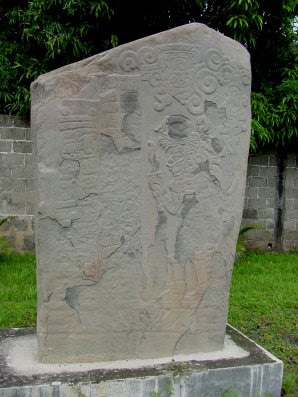 The Stela 1 from El Baul has one of the earliest hieroglyphic inscriptions found in Meso-America, with the earliest legible date known in the modern territory of Guatemala, going back to the year 37 AC. The region experienced an extraordinary development during the Late Classic period, between years 500 and 1000 AC. At this time, Santa Lucia Cotzumalguapa became one of the largest cities in Southern Meso-America, a major center of political power and cultural innovation. Research has shown that the city covered approximately ten square kilometers, and included two major architectural compounds, which correspond to the sites known as El Baul and Bilbao. Both are large platforms that sustain colossal compounds, and possess the major concentrations of monumental sculptures. A third important compound, known as El Castillo, also formed part of this urban center, and may have been the main plaza of this great city. A system of causeways and bridges joined together these three compounds with each other and with other sectors of the city. 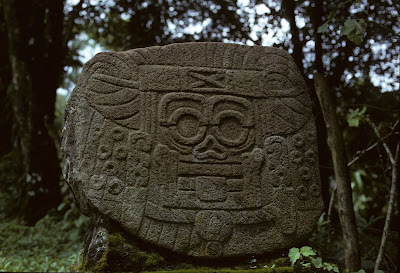 The inhabitants of this area developed an original artistic style and a writing system of their own, which found expression in a large corpus of monumental sculptures. These include rock carvings, stone stelas, altars, gigantic heads, and three-dimensional sculptures, as well as a variety of architectural sculptures such as carved stairs, pillars and pavement stones. There are also numerous portable sculptures. Characteristic of the Cotzumalguapa style is an extraordinary degree of realism in the representation of human figures, which in many cases may be considered as individual portraits, possibly representing kings and nobles. In many cases, these individuals appear participating in complex scenes, where they interact with other human characters or with supernatural beings. Sacrificial scenes are frequent. Distinctive elements of the Cotzumalguapa style include speech scrolls shaped as vines with a variety of flowers and fruits. Hieroglyphic signs usually are inscribed in circular shapes, but they may also acquire complex animated forms. Cotzumalguapa was most likely the seat of a powerful state, which exerted political control over a vast region of the Pacific coast. The diffusion of the sculptural style provides a measure of the geographic extension of Cotzumalguapa influence. The style is found along a 200 kilometer stretch of the Pacific coast, from the department of Suchitepequez to the modern border between Guatemala and El Salvador. It also had strong presence in some regions of the Central and Eastern Highlands, particularly in the region of what we know today as Antigua Guatemala. Some elements of the style are perceptible in sculptures from various sites located in Chimaltenango and along the Motagua river valley. Cotzumalhuapa culture, located on the Pacific piedmont of southern Guatemala, in the Escuintla Department, on the outskirts of Guatemala City. Cotzumalhuapa was a major city that extended more than 10 square kilometres (3.9 sq mi), encompassing three major compounds, two of them known as El Baúl, and Bilbao (Wikipedia), were excavated by my father Stephan de Borhegyi, and fellow archaeologist Lee A. Parsons, in the early 1960's.This area near the border of Mexico and Guatemala, is most likely where the mushroom cult got it's start, based on the numerous mushroom stones found in this area. It was in this region that the decapitation of human heads and the dismemberment of body parts reached new levels. My father, surmised that victims or captives for sacrifice were decapitated by priests or ballplayers dressed in were-jaguar attire after which the decapitated heads of both ballplayers and jaguars were hung up by ropes over ballcourts or temples. Stephan de Borhegyi proposed that the stone heads and later stone rings set in the walls of formal ballcourts were a symbolic replacement for the trophy heads of earlier times (Borhegyi,1980:20, 24). These trophy heads were venerated as sacrificial offerings, and may even have been used during certain ballgames in lieu of balls. Very interesting information. It motivates me to continue researching and learning. Thanks for sharing!